2. Halve the sprouts lengthways and cut the potatoes into pieces roughly the same size as the sprouts. 3. Place the sprouts and potatoes in a baking dish. Sprinkle over the chilli flakes, drizzle with the olive oil and season. 4. Bake for about 30 minutes, until the vegetables start to turn a golden brown. 5. Remove from the oven and add the hazelnuts before placing the tray back into the oven for another 8-10 minutes, until the hazelnuts are golden brown. 6. 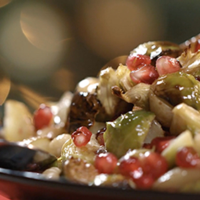 Remove from the oven, drizzle with the maple syrup and stir through the pomegranate seeds.